Why do people move to North Carolina? For more than twenty years, migration has fueled North Carolina’s growth. People move from other states and countries to go to school, to work, and to retire throughout the state. Between 1990 and 2010, North Carolina gained more than 2 million new residents due to migration. New Census Bureau estimates for July 1, 2013 total population show that migration continues to drive North Carolina’s population growth: 175,000 people moved into the state since 2010, accounting for nearly sixty percent of the state’s 313,000 person growth over the last 3 years. International migration has slowed significantly due to the global economic recession. While domestic migration into the state has declined from its mid-2000s peak, it remains equal to migration levels 10 years ago. North Carolina received the same number of net migrants from other states between 2010 and 2013 as it did between 2000 and 2003. North Carolina’s appeal as a moving destination recently made headlines, as, according to Atlas Van Lines, it was the only state to have a majority (55% or more) of inbound moves for every year since 2004. (The District of Columbia also had 10 consecutive years of inbound moves, but it’s technically not a state.) Nearly all data sources—IRS migration files, the American Community Survey, Census Bureau Population Estimates, and other moving companies—show similar migration patterns. While the migration patterns are intriguing, a more interesting question is why people move. Migration is traditionally the most difficult demographic process to measure. Reasons for migration are even more difficult to capture, and we are typically left to infer conclusions based on other data elements and anecdotes. Fortunately, the Current Population Survey (CPS) introduced a module in its March survey that has directly asked movers why they moved every year for the last 15 years. Looking at data for 6 years before the recession (2002-2007) and 6 years following (2008-2013) reveals that little has changed in the fundamental reasons why individuals move to North Carolina. Work: People are moving because they received a new job or were transferred, they want an easier commute, they retired, or because they are unemployed and looking for work. Family: Individuals are moving due to household changes, such as a divorce or separation, or children are moving away from their parents to establish their own households. Housing: People are moving because they bought a home, wanted nicer housing or a better neighborhood, or are looking for more affordable housing. Other: Individuals may be moving to start college, for health reasons, because they want a change of climate, or for non-voluntary reasons, such as natural disasters or foreclosures. Figure 1 shows, regardless of time period, nearly half of individuals moving to North Carolina moved for work-related reasons. Another quarter moved for family-related reasons. Housing-related moves declined slightly during this time period, while moves for other reasons increased slightly. Although the broad reasons why individuals moved did not change significantly, the data reveal the lingering effects of the recession in the detailed reasons individuals give for moving. 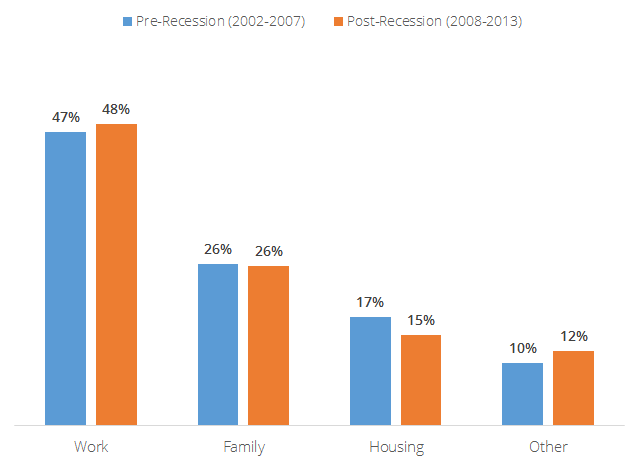 Comparing pre- and post-recession shows a decline in individuals moving to establish their own households (5.4% to 3.5%), consistent with higher youth unemployment rates and increases in young adults moving back in with their parents following college graduation. Fewer individuals moved because they wanted to own a home and not rent (3.3% to 0.6%), reflecting the impact of the housing crash on both willingness to purchase a home and the ability to do so. Last, there was a slight decline in individuals who moved because they were looking for work (6.6% to 5.6%). This is largely due to the significant decline in international immigration, as international immigrants are more likely to move to seek employment than domestic migrants. The reasons given for moving that were more frequent in the post-recession period were typically in the “other” category, such as “Other family reason”(16.6% to 18.6%) and “Other reasons” (1.1% to 4.3%). What does this mean? Migration decisions are complex. As the recession lingers and other demographic processes unfold, such as population aging, individuals may find that their reasons for moving do not fit neatly into the given categories. If this is the case, we may see additional categories introduced to the CPS questionnaire that better capture these dynamics, just as displacement due to natural disasters was added following Hurricane Katrina and moves due to eviction and foreclosure were introduced in the aftermath of the recession. Data used in this analysis were drawn from IPUMS-CPS. This entry was posted in Migration and tagged Census Bureau, Current Population Survey, housing, migration, population estimates, population growth, recession, unemployment. Bookmark the permalink.